The painting was one of seven commissioned by publisher George Barrie of Philadelphia as illustrations for his monumental work The Army and Navy of the United States, published in Philadelphia, 1889–95. It was reproduced in section 8 as a 9½-by-11¾-inch photogravure, hand colored in deluxe editions. The image was also issued separately as a black-and-white mounted print. The rapid Union retreat from the first Battle of Bull Run was the subject of Trego’s final work for George Barrie. 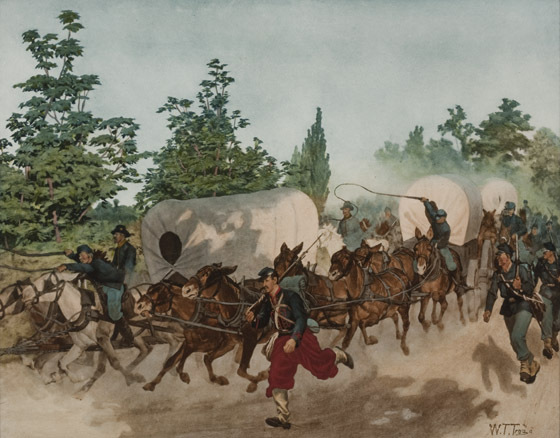 The Conestoga wagons, teams of mules, and foot soldiers are in headlong flight as they flee the Union army’s first debacle of the Civil War. The mules all bear subtle facial expressions, with the protruding tongue of one animal comically suggesting the urgency of the moment. Perhaps to emphasize the speed of their dash to safety, the men and animals barely seem to touch the ground as they run. This particular illustration became one of the most popular of the works Trego did for George Barrie. As “The Rout of the Federal Army After the Battle of Bull Run,” in color, in Guy Carleton Lee, ed., The History of North America (Philadelphia: George Barrie, 1904). Reproduced as a glass magic lantern slide, “#250. Northern Conception of Enthusiastic Troops,” the Pageant of America series (New Haven, CT: Yale University Press, c. 1925). Used as illustration, “The Great Skedaddle,” in Wendy Vierow, The Battle of Bull Run: Confederate Forces Overwhelm Union Troops (New York: Rosen Publishing Group, 2004), p. 15.